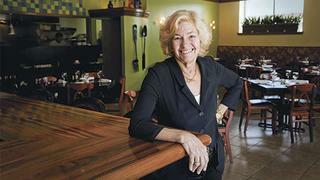 Nancy Mueller's fortune came from developing her catering and food company. Nancy Mueller brought her business management skills into play when ordering Andiamo's build. 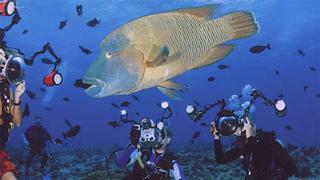 Andiamo's decade-long series of voyages enabled Mueller to dive and photograph to her hearts content. 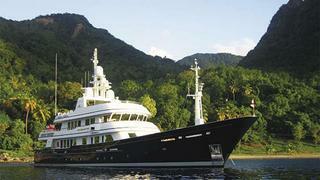 Andiamo has circumnavigated the world during Nancy Mueller's 10-year ownership. Even Andiamo isn't immune from being photobombed by wildlife. If you are American, it's very likely that you will have come across yacht owner Nancy Mueller - although you might not have realised it. She's responsible for Nancy's Specialty Foods, and the frozen appetisers and entrées that have been rescuing the busy party host or hostess for the past three decades. Mueller started the company from her kitchen, and sold it in 1999 and built the 42.6 metre FeadshipAndiamo (now Angiamo). She's been cruising the world with her camera and scuba gear ever since. 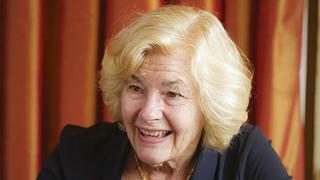 Nancy Mueller was a natural-born entrepreneur, selling lemonade from a kerb-side stand as a six-year-old. But she began her working life as a research chemist, graduated with a bachelors degree in chemistry from Russell Sage College, New York, in 1965, and followed her new husband, Glenn Mueller, to Stanford. There she took a job with Syntex Corporation in Palo Alto, California, at the heart of the nascent Silicon Valley. In the 1960s, Syntex was a high-flying corporation, responsible for the female birth-control pill. Her career as a chemist ended after five years when the couple had children, but her entrepreneurial spirit could not be held down. Glenn Mueller was a Silicon Valley venture capitalist and entertaining was a part of life; every year from 1972 to his death in 1994, Nancy held a Christmas party for a couple of hundred people and made a lot of appetisers. Back in 1972 it wasn't possible to buy vol-au-vents from the local grocer, and Mueller soon spotted the gap in the market: the busy, liberated baby-boomer generation needed help with all that partying, and Nancy's Specialty Foods stepped in. The company started in 1977 when, encouraged by friends, she began to sell her appetisers to local shops and restaurants. The early path was not smooth: by late 1983 it was a company of 50 employees manufacturing pastries, largely by hand, and $500,000 in the red. Two weeks before Christmas that year they sat down to figure a way out of the hole  and came up with Petite Quiche (described as Swiss cheese and savoury bacon with fresh milk, eggs, onions, and chives, delicately baked in a rich buttery pastry). Mueller took the new product down to the American bulk-buy retail chain Price Club, which ordered 25 cases for two outlets and it flew out of the store. The rest is history  that, a lot of hard work and initiative, and a great-tasting crust. Mueller built her company to a multi-million-dollar business from $30,000 of start-up capital, by identifying problems and finding innovative solutions. There was the retired aerospace engineer down the street, who made the jigs and dies for the pie-maker, the spinach press that started life as a washing machine, and the in-store product demos. And there were lucky breaks: while Julia Childs' Mastering the Art of French Cooking had introduced quiche to a US audience in the 1960s (and taught Mueller to cook), it was Bruce Feirstein's 1982 bestseller, Real Men Don't Eat Quiche, that brought it into the mainstream. By the time she sold up in 1999, Nancy's Specialty Foods had 350 employees and was still expanding. But there were other things she wanted to do and she was concerned that 65 per cent of her business was with just two companies. "And so I converted quiche into yacht," she explains. "Not all of it, but I converted some of the quiche returns into yacht."
Mueller's boating story starts young, when her family rented an off-season Nantucket shack from a friend. She was only eight or nine, and would sit on the beach watching the boats and want to be out there; sadly, her family didn't have the money. But the seed was sown and it got watered a little more in 1968 when she was on vacation in Italy with Glenn, living on $5 a day. Friends had recommended they see Portofino. "We ended up spending $20 for a room there, which was unbelievably expensive, but it was the best time we had", she recalls. "We walked the quay behind all those big fancy boats with the flowers and the stewards and everything. We both felt that was what we were aspiring to."
At Stanford, Nancy took sailing lessons with Glenn and they bought a Santana 22 with a friend, owning it for five years, sailing and racing out of Sausalito Yacht Club. The next boat was a Ranger 26, then a Cal 330, but that needed more crew, and with their friends starting families, it got harder to find people. So they swapped to a motor yacht: a Grand Banks 42, eventually replaced by a 16 metre Tollycraft they had built in 1989, cruising her as far north as Alaska and as far south as Acapulco. They didn't always take their own boats, though: they also chartered. It was another trip to the Mediterranean that was to be influential: three weeks in 1992 on a 37 metre motor yacht. "This was the height of my husband's fantasy, a wonderful experience and it really gave us the bug," she says. His tragic early death in 1994 dashed those fantasies. Four years later Mueller took a break, went down to San Diego and Baja on the Tollycraft with the captain and a friend. She had already called in an investment bank to value the business: "At the end of this cruise I came back and decided I was going to sell; it was an emotional release that I felt being on the boat, on the water, and I decided that was what I wanted to do. I was 55 and I had the rest of my life in front of me. I had a business that was booming - what better time to sell a company?" And so Andiamo was born. 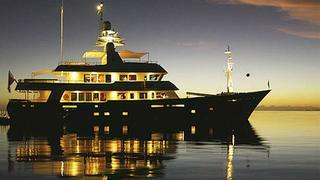 Nancy's was sold on 31 July 1999 and Mueller already had a plan for a 32 metre motor yacht. She hired a naval architect, Doug Sharp, to advise her and write the specifications - and she read all the magazines. She visited design firm Glade Johnson in Seattle and chose it to do the interior, and even did $250,000 of tank testing. She wanted a classic look, an expedition boat, and slowly, inevitably, it got bigger. The whole metrics of the boat came from the galley. The (cooking) pots that I got, I took them over to Feadship and [told them] this is how they are going to be organised in the drawer, build the drawer that size and it was from there the boat flowed."
Finally, Andiamo was drawn to be 42.6 metres and Mueller took bids from six yards, visiting five of them before choosing Feadship. The contract was placed in January 2000, with Mueller retaining a lot of control. "I basically made all of the decisions in the yacht except the engine room and the mechanics."
The boat was Lloyds-built and MCA-regulated - Mueller is very safety conscious, doing all the training for her captains licence during this period. She hasn't done the hours to get the ticket, but she has all the knowledge to help her make informed choices. "I would encourage every owner to do that; it put me into the minds of the crew. It was the only boat I was ever planning on building and it had to be right."
Safety first and function over form were her mottos, and with good reason; Andiamo has ranged far and wide over the oceans and seas of our planet, and even has thickened plating at the waterline to repel a half-sunken container at 11 knots. She was launched for sea trials in October 2002, with Mueller taking ownership on 3 January 2003, almost exactly three years after she was ordered. Andiamo won a Showboats Design Award that year. 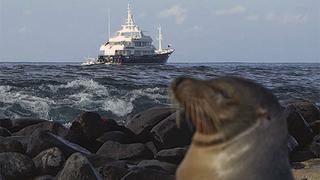 The crew took Andiamo to the Canaries from the Dutch Royal van Lent shipyard where she was built, and Mueller joined her there for the trip across the Atlantic to St Lucia. Mueller's daughter had graduated from business school and they threw a celebratory party on the island with 12 of her friends, the crew, and even some service technicians who were on board. For the first three years Andiamo mostly remained in the Atlantic, moving into the Pacific after Raymond Heer took over as captain. Mueller says she strives for a collegial atmosphere; the uniforms are informal and the captain will usually dine with the guests when they are not at sea. For the past nine years (with one exception) she has spent more than six months out of every 12 on board, usually in five or six trips. Whenever his schedule permits, Nancy Mueller is joined by her husband Bob Fox - she remarried in 2001 - and each trip is broken into smaller cruises, punctuated by the departure and arrival of groups of friends. Since setting off into the Pacific, Andiamo has been on a slow, steady circumnavigation. Mueller says there are three motivations for her cruises. First, she wanted to be with friends; each cruise was long enough that everyone aboard would have the opportunity to get to know each other better. Second, Mueller wanted to get to see the world, to get to know the cultures of the world. She'd done the ritzy places and she'd much rather anchor off a remote beach than be moored somewhere trendy. Finally, there was the diving and the photography. The diving came first and she added the camera when a friend suggested the idea, subsequently specialising in underwater images taken during her 1,100 dives. She currently has a three-month exhibition under way at the Apalachicola Museum of Art in Florida. Nancy Mueller has taken Andiamo east through the Mediterranean to Turkey, north to Maine in the Atlantic and Alaska in the Pacific. They've gone south to the Galápagos islands and then on the westbound trail to French Polynesia, Tonga and Samoa, down to New Zealand, back north to Vanuatu and Australia, Palau and Papua New Guinea, before heading into Asia and visiting Borneo, Thailand and Myanmar, then westward again across the Indian Ocean before tackling the Suez Canal (complete with armed guards) to return to the Mediterranean. 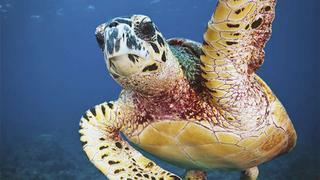 Mueller's favourite areas include Vanuatu, south east Alaska and the Galápagos islands, with the Tuamotu Archipelago and Indonesias Lembeh Strait her top dive spots; the former for the sharks and the latter for the photography. It's an extraordinary travelogue and the photographs are stunning. The memories must be incredible, but nevertheless, Andiamo is now listed for sale. "I've been to most of the places I want to go to, and I have to admit, after nine years of being gone for more than six months a year, travelling to faraway places, I got a little homesick. It was originally a 10-year project, but once I was over in Sri Lanka I just decided to keep going."
Mueller thinks she will wait a couple of years to see how she feels about another boat, and perhaps charter in the meantime. She admits that it wont be the same  shell now have to pack her dive and photography kit, for example, instead of having it on board waiting for her. But shell have a little more time for her other interests; shes a trustee at the technological university Rensselaer Polytechnic Institute in New York, a position she took over from Glenn Mueller, and shes on the board of the San Francisco Opera, after going to see La Bohème following his loss. Mueller's is a remarkable story of achievement; she seems to have had no trouble with glass ceilings, saying it's because she ran her own business, rather than climbing a corporate ladder. She was also inspired by her college, where not only were all the students female, but all the positions of authority were held by women as well. "We didn't think of ourselves as not being able to do something," she says. On the whole, she feels she got the respect she deserved from the men she came across in business - whether they were plant manufacturers or Wall Street bankers. But then, once you've met her, you realise it couldn't be any other way. This article was originally published in the September 2012 issue of Boat International. Andiamo has since been sold.